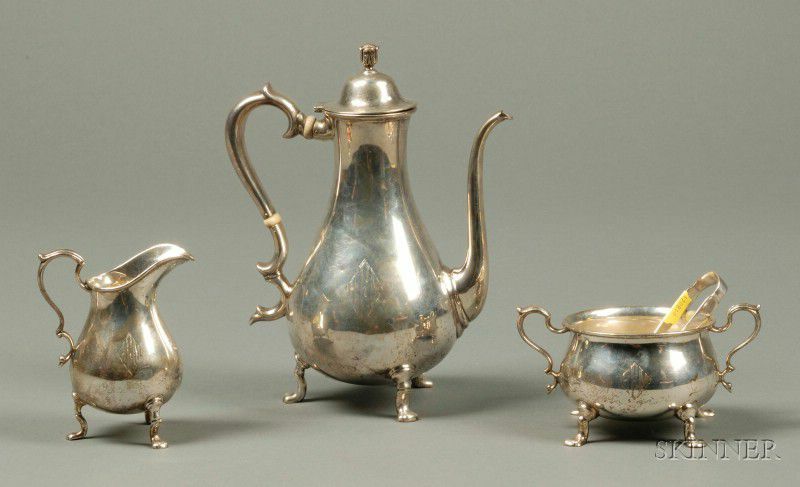 Three-Piece Sterling Demitasse Set, early 20th century, A. Stowell & Co., pear shaped coffeepot with floriform finial, pear shaped creamer, and ovoid open sugar, all with serpentine handles, and trefoil topped legs with trifid feet, monogrammed, pot ht. 8 1/4 in., together with a pair of Towle sugar tongs, (4 items total), approx. 24 troy oz. sugar with some pitting to interior. 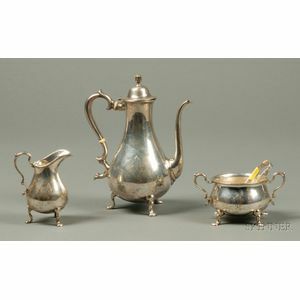 Creamer with dents to base of handle, and some dings to bulbous portion of body. all with etched inventory/insurance numbers to bases.